Overwhelmed with Preschool Homeschool? Here's how to simplify! Welcome to the New Look!! Click on the link below and you will be sent directly to the October 2016 E-zine Page. There's a lot on this page, so I hope you like what you read and I hope it is helpful to your homeschooling journey. Keep your little ones busy without feeling overwhelmed! Do you have a bunch of littlies or do you have older children and a toddler who actively wants your attention. You might be wondering how it all works and you may be asking, "How do I manage my little ones while homeschooling?" That is the focus of this E-zine as I direct you to my latest page on Homeschool Preschool. On this page, I talk about the decline of "play" in our society and its effects and also how we can keep our little ones busy and involved without getting overwhelmed and burnt out. I've done some research for you and it's all here in my Ezine for October, 2016. In the E-zine,(click on the link below...) there's news about Subscriber details just for you! Over the last month, I have added a new section on my pages called the "Teaching Toolbox". You can read more about that in the Ezine also. There is a new Subscribers Only! Page and using the password, keepontrack you can get to freebies and latest downloads. 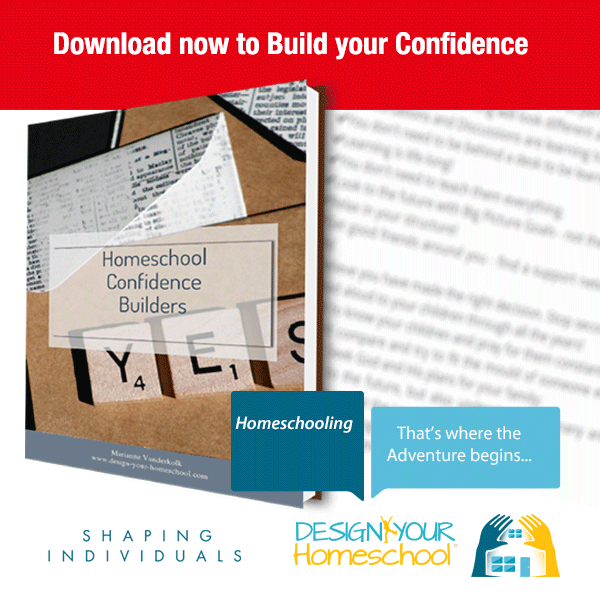 This month, you can download the ebook, "Confidence Builders for Homeschooling." Go to the October 2016 Homeschooling E-zine here. Live life with your kids and remember - You are not on your own! God will give wisdom to those who seek it and He can do immeasurably more than we imagine!